Unfortunately I couldn’t make it down to the Football Writers’ Festival over the weekend despite being graciously invited, although I wish I had ended up at the Jamberoo Pub given some of the content it produced. Congratulations to Fair Play Publishing and the Johnny Warren Foundation for putting on such a well-received event, and kudos to Bonita Mersiades for coming up with the idea in the first place. And full credit to FFA Chairman Chris Nikou for making an appearance too. Nikou was professional enough to answer questions in a session chaired by The Daily Telegraph’s underrated football reporter Emma Kemp, and by all accounts he put his foot in it with one specific response. “As I stand here now promotion and relegation is unlikely until 2034,” Nikou told the audience in response to a question from the floor. “You need to have a second division established. Those clubs need to be able to step up… if the gap is too big they won’t be able to do it,” The Age’s resident football expert Michael Lynch reported him as saying. So there you have it. No promotion and relegation from the A-League for the next 15 years. A media release that went out shortly after sought to clarify Nikou’s comments. 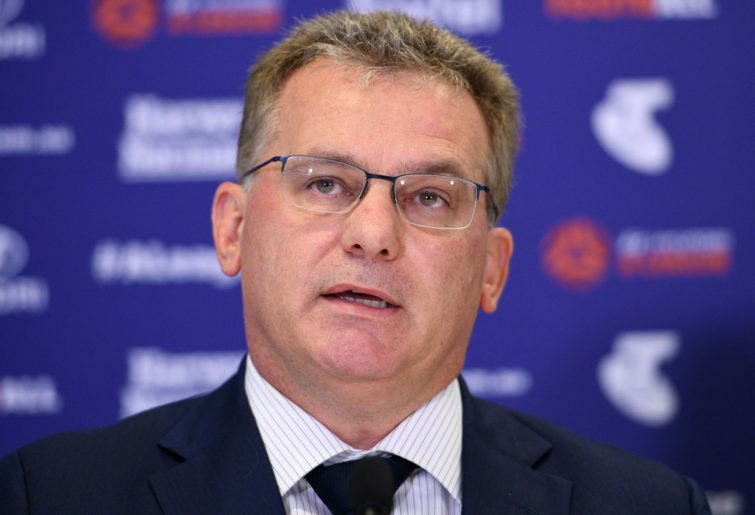 “Under the terms of the existing Club Participation Agreement (CPA), existing and incoming Australian Hyundai A-League Clubs are entitled to participate in the Hyundai A-League until the year 2034,” it read. So in other words – and contrary to Nikou’s comments – promotion and relegation is potentially on the cards much sooner than 2034. “These provisions are expected to include the specific timing of the establishment of a Second Division, targeted commencement of promotion and relegation to and from the Hyundai A-League, and the prioritisation of Second Division Clubs as part of expansion of the Hyundai A-League beyond 12 teams,” read the final paragraph of the release. A couple of FFA board members also got on Twitter and suggested that Nikou’s comments were simply off-the-cuff remarks and not to be interpreted as the FFA’s official position. And as Lynch pointed out in his quick-fire online report, the Association of Australian Football Clubs is hopeful an official second division will be ready to kick off as early as next year. There are a few other important points worth unpacking here. The first pertains to who is in charge of the A-League and how binding the Club Participation Agreement is in the first place. Nikou was decent enough to honestly answer a question put to him from the floor, but it probably doesn’t mean much if the FFA is no longer in charge of running the A-League anyway. And while the ten current clubs might not fancy a stint in the second division – and could potentially cite contractual stipulations to avoid it – there’s a bigger question at stake than the broader philosophical debate surrounding promotion and relegation. Namely how can it be funded? Especially if the next broadcast deal is less than the current one? We have to be careful of pretending that the A-League is inherently unique, because for too long the idea of Australian exceptionalism has been used to lock others out of the game. But the most pressing issue in Australian football right now is not when promotion and relegation will be introduced, but how it will be funded. Figure that out and our football might just be on the right track.